What is the role that going public plays for architects today? Is it an option or a must? And what is it all about? Getting published, getting new commissions, or defining the public role for architects within the communities and realities they work in? 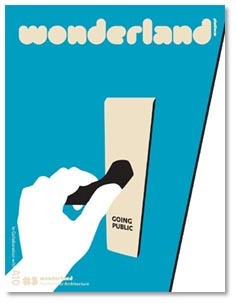 ‘Going public’, as we mean it, is not only self-marketing, but also public discourse, the discussion between the architect and non-architects. The more often it happens, the better the architectural understanding of the public – and more likely new, good architecture is to gain acceptance. The third wonderland magazine is informed by three guiding questions: why, how and where to go public. The first section focuses on the question that should be precede the other two: why do it all? What are the reasons for seeking publicity, for going public with an idea, a design, a building? The second part deals with what is perhaps the most pressing question: how to find a public and publicity, how to create a public image. This section is mainly about media and mediators, to those who help to give architects and architecture a public presence and significance beyond the mere fact that they are alive and in business. 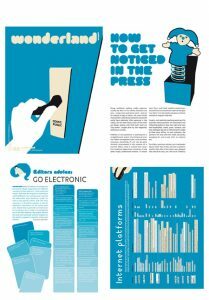 The third section takes a closer look at where public attention can be found, which media are relevant and at the different situations in various countries.